California avocado season is here and the California Avocado Commission invited me to participate in a California Avocado Grove Tour. It's no secret: I love avocados and from now until Labor Day, we are in California avocado season. 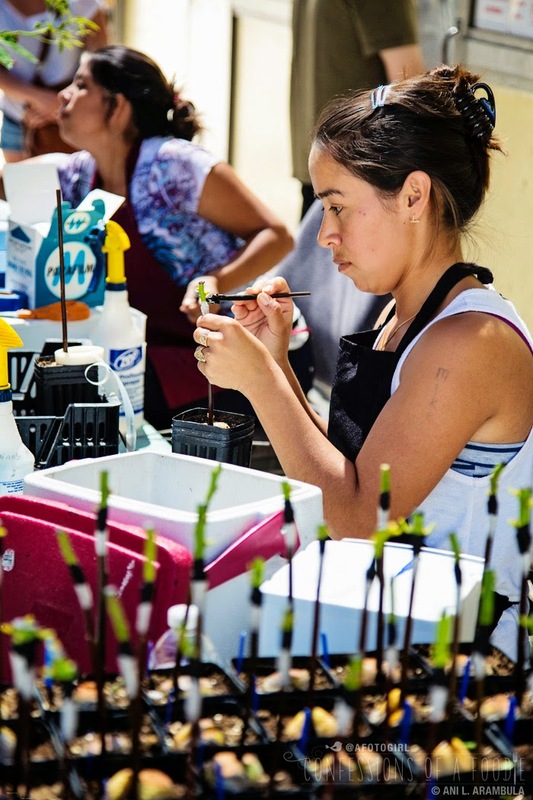 So imagine how excited I was when I was contacted by the California Avocado Commission to participate in their latest California Avocado Grove Tour. Oh yes, please! 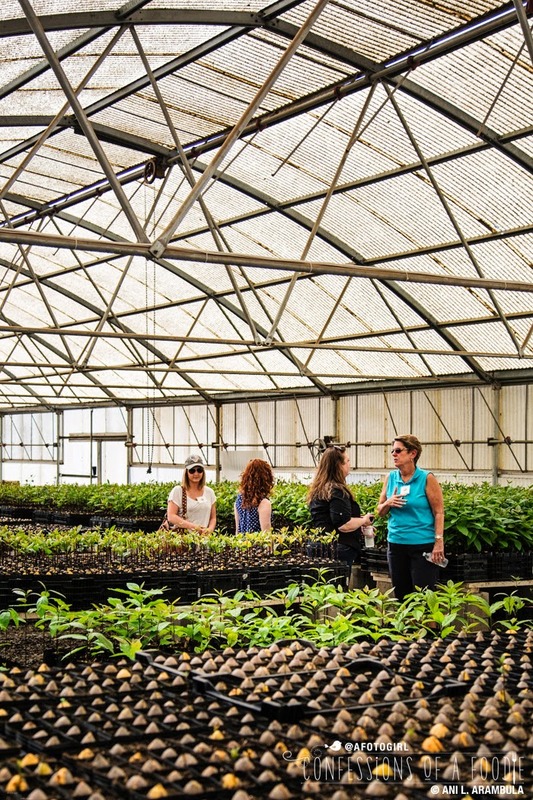 The tour started at Persea Tree Nursery in Fallbrook, California. Stepping into the greenhouse was like stepping into a sauna. It's about 80 degrees inside but the humidity makes it feel even hotter. Apparently, these little guys love it. 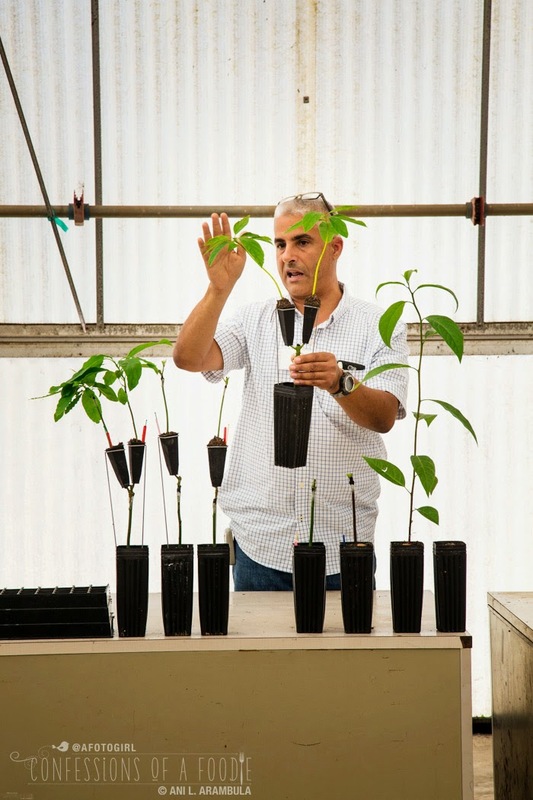 Alex Gonzalez, principal with Persea, explains the rootstock development of the trees. 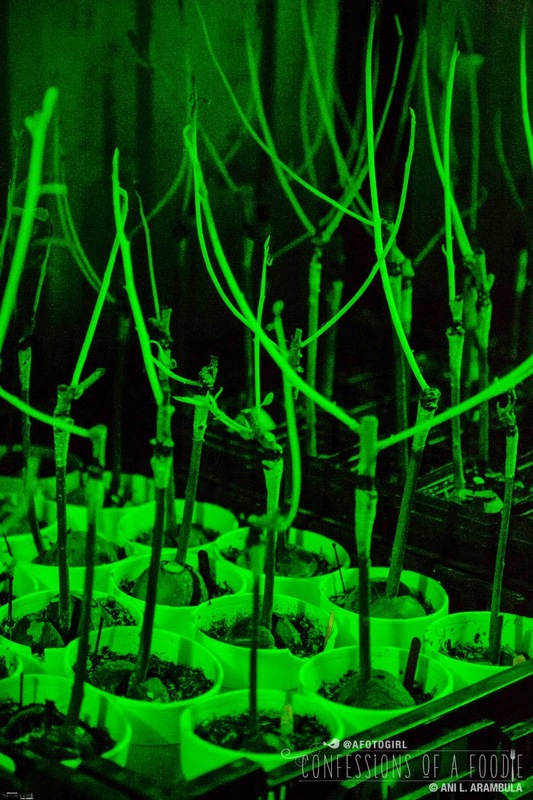 The rootstock is started in a dark green lit environment (below). Devoid of sunlight while they begin their life, these little guys are forced to root. The lack of sunlight means that their cell system doesn't know what exactly they are let alone what they will become. They are, in effect, a perfect blank canvas. 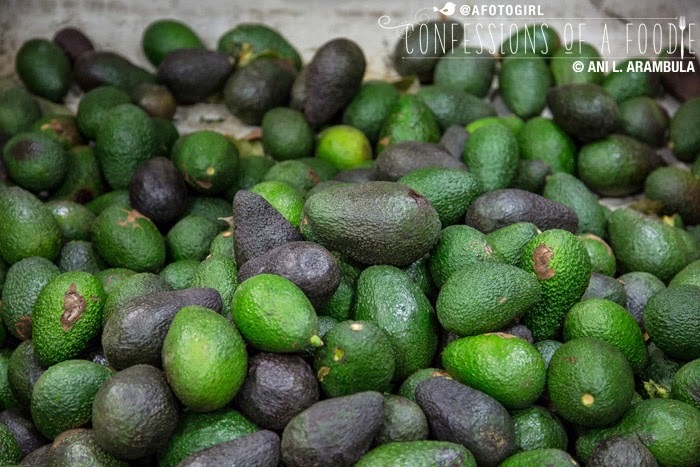 Once the root system has taken hold, they are brought out into the light where workers graft onto the rootstock the variety of avocado that it will produce. 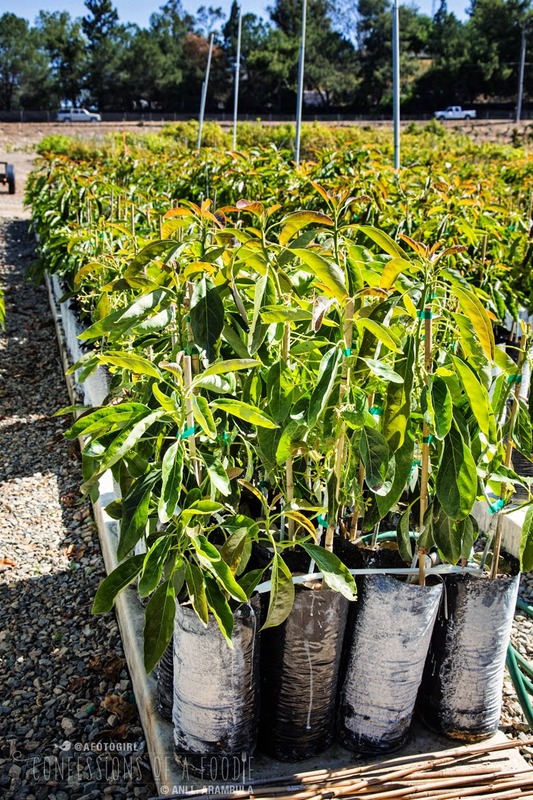 This process allows Persea to develop clonal avocado trees that will be more tolerant of root rot and saline (from well water) while providing a high yield of fruit. 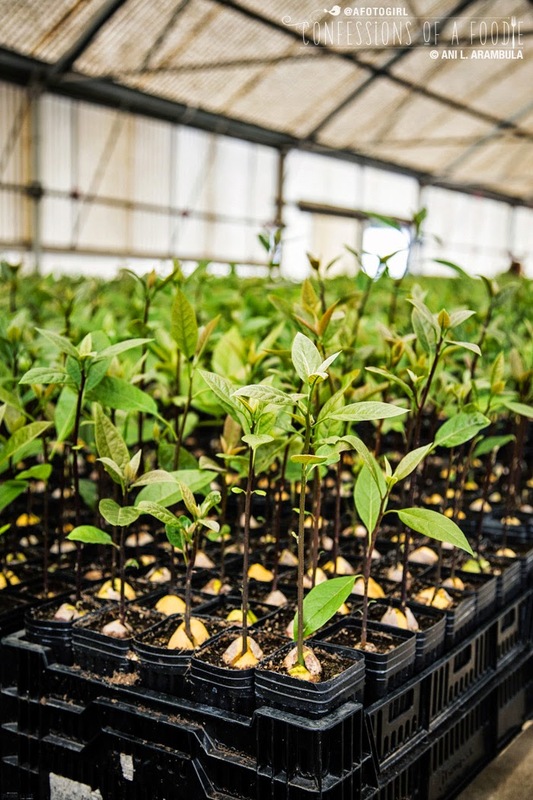 According to Alex, the younger the avocado trees are planted into the ground the faster (and better) they'll establish. Better growth equals a happy plant. 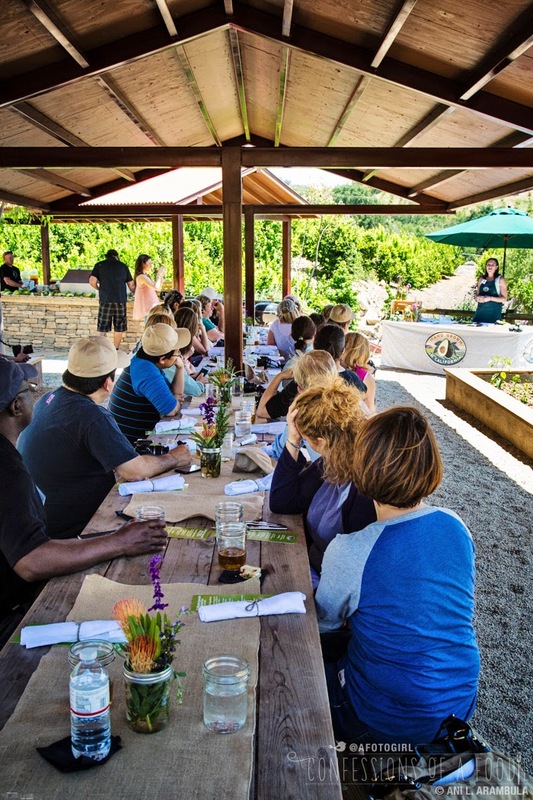 Our next stop on the tour was Rancho BellaSanté, a 112-acre farm in the hills overlooking Temecula which grows avocado, citrus and wine grapes. 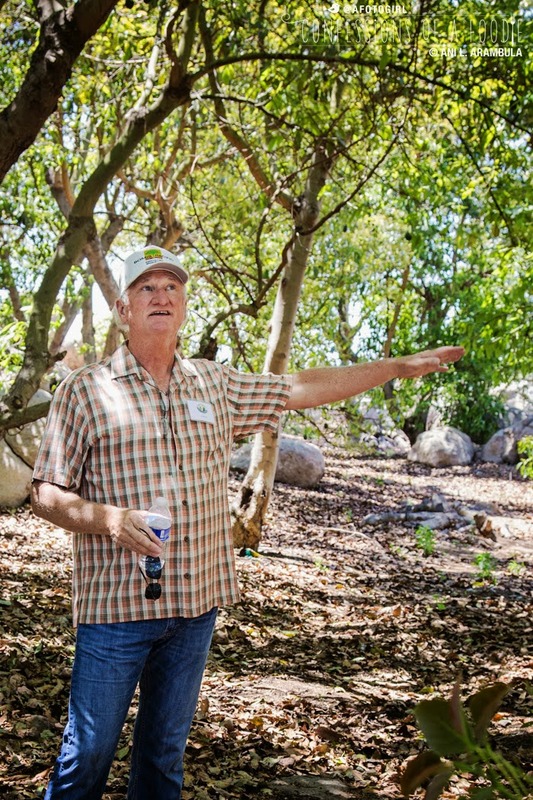 Scott McIntyre, owner and CEO of Sierra Pacific Farms which owns and runs Rancho BelleSanté is a third generation avocado grower. Seen here under the shaded canopy of avocado trees, he explains to us that avocado harvest cannot be automated. Due to government regulations, avocados for sale cannot touch the ground. 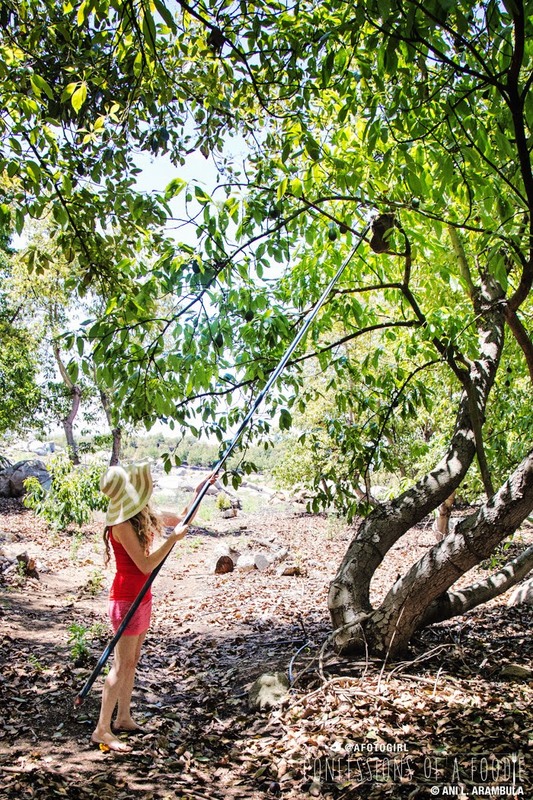 That means, avocados must be picked by hand, one avocado at a time. 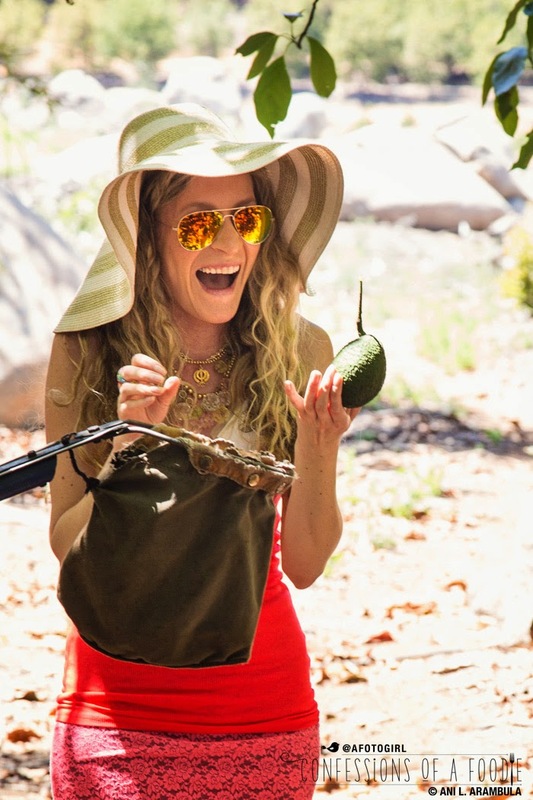 Here, Katherine of Bombay Blonde, takes a stab at picking an avocado. After others failed or struggled before her, she was quite happy at being successful almost immediately. 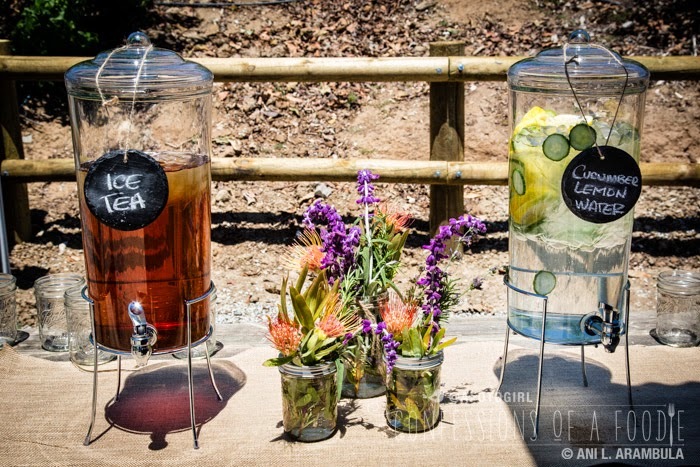 Lunch was served on the grounds of Rancho BelleSanté and began with refreshments and appetizers. 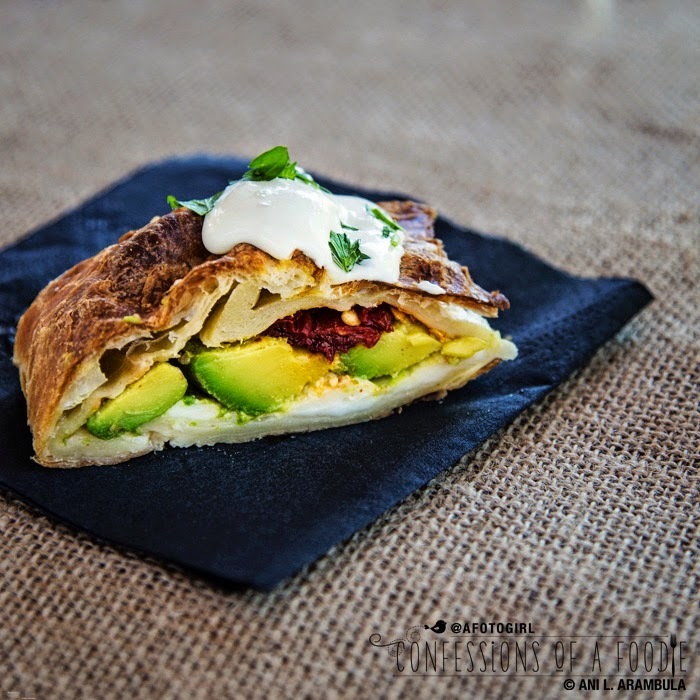 Naturally, the food was avocado centric with interesting and tasty combinations of fresh ingredients brought together by chef Adrian Halmagean of Sorrel Bistro in Temecula, California. 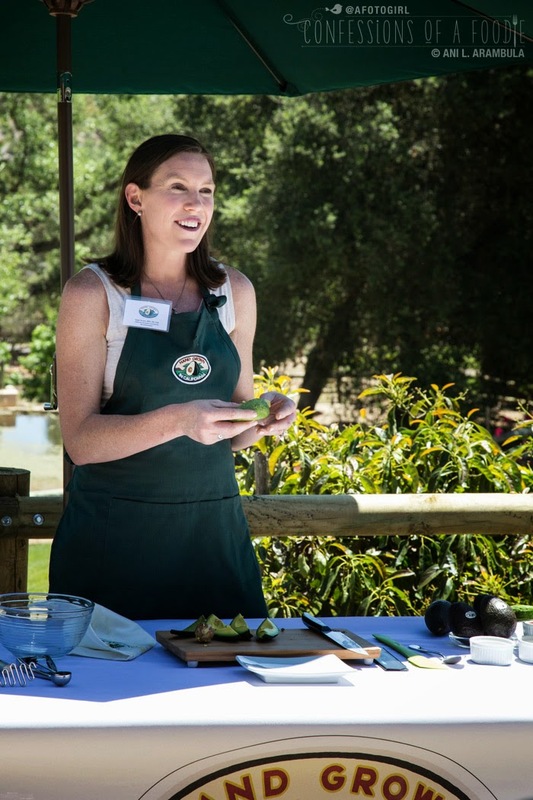 Registered dietician, Katie Ferraro, demonstrated how to safely pit an avocado by first quartering the fruit then carefully pulling the quarters away from the pit one at a time. Personally, I prefer the whack in the center with a chef's knife method but I've been peeling and de-pitting avocados since I was a kid and have never slipped. Our hungry group listens to Katie's presentation while we await the main courses. 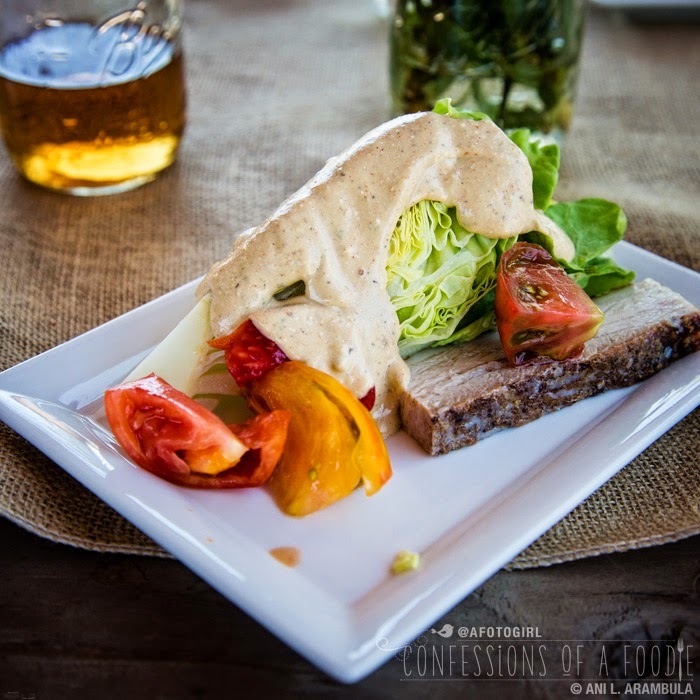 This Pork Belly and California Avocado Wedge Salad is the best wedge salad that I have ever had. The crisp butter lettuce and tangy, slightly spicy avocado dressing with a hint of bleu cheese was the perfect foil for the cold, flavorful yet rich pork belly. California Avocado Turkey Burgers were fine but the meat needed more seasoning and the bread was too dry for my tastes but those California Avocado Tater Tots that came with it were outstanding. They were crunchy on the outside and creamy, tender and green on the inside. 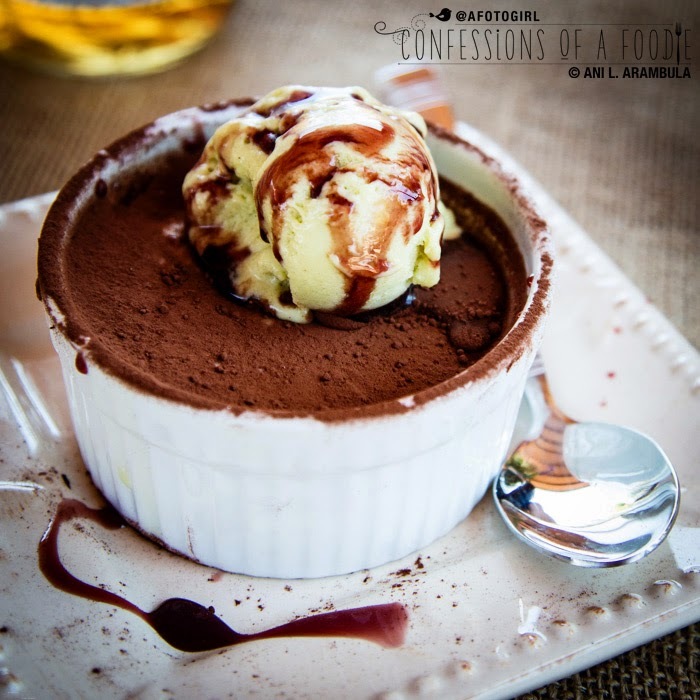 Not being a fan of panna cotta in general, I wasn't sure what to make of this California Avocado Panna Cotta served with Avocado Ice Cream and drizzled with a balsamic reduction. I inhaled the ice cream and reduction but wasn't a fan of the panna cotta itself. The flavor was a bit muddled sans ice cream, cocoa and balsamic so I left most of that behind. Having just recently purchased my first ice cream maker, however, I think I will need to try creating some avocado ice cream at home. Overall, the meal was quite enjoyable and who would have thought that avocado could be presented in such a variety of ways? Big gold star to Chef Adrian for the creative recipes. After lunch, we headed to West Pak Avocado where we broke up into groups for a tour of the packing facility. The headquarters recently moved to this 115,000 square foot facility in Murrieta, California. 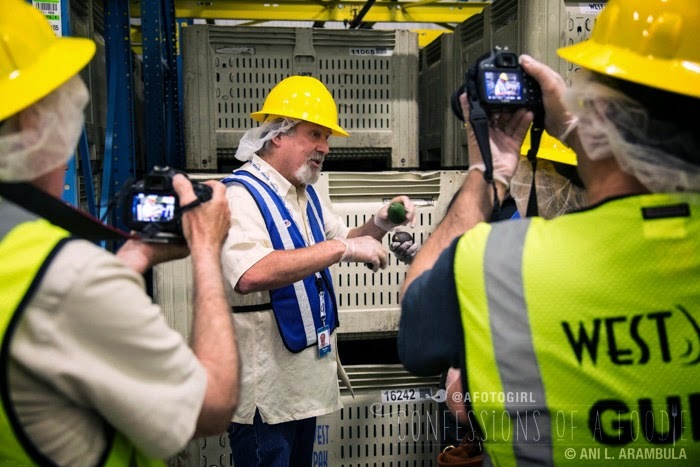 Here, West Pak partner, Randy Shoup heads up our group's tour explaining the intricacies of sorting, storing, packing and shipping avocados. Even with the modern facility, nothing beats human eyes. 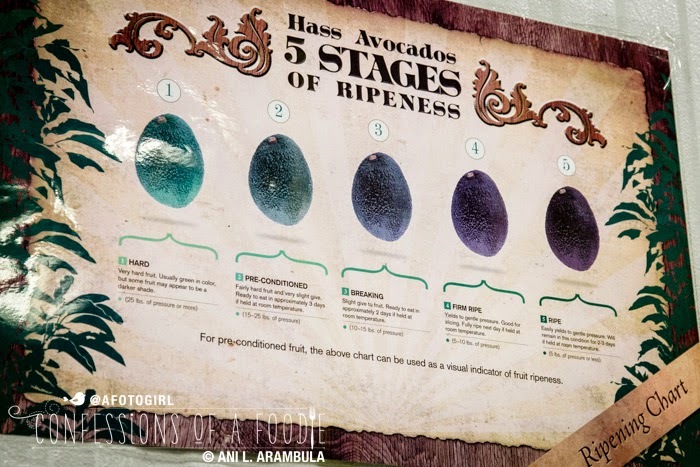 The initial grading of all avocados is still done by hand: Grade 1 (minimal to no blemishes, fruit sold in stores); Grade 2 (visible blemishes on skin proportionate to the size of the avocado, fruit sold to food industry) and Grade 3 (very blemished, fruit used for cosmetics). 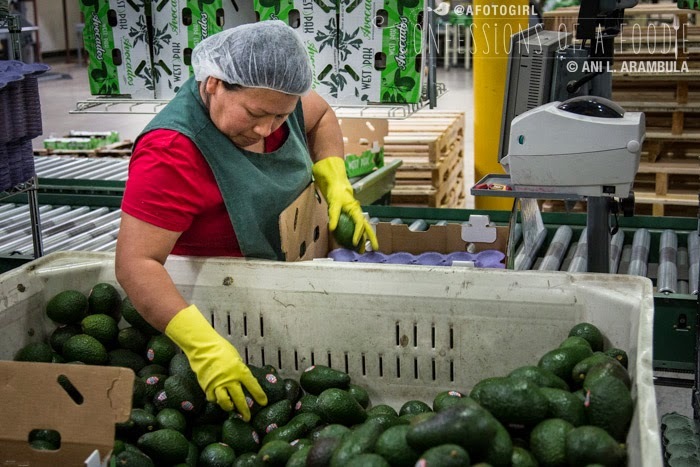 A West Pak employee hand packs each avocado that has already been sorted by weight. 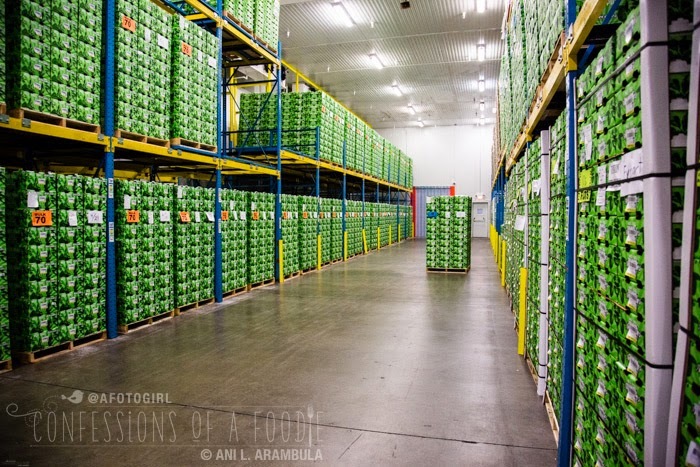 After the avocados are packed, they are placed in a huge temperature controlled cooling room sorted by grower. In these rooms (chilly!!) the avocados are cooled down to shipping temperature to keep the avocados from ripening during shipment. 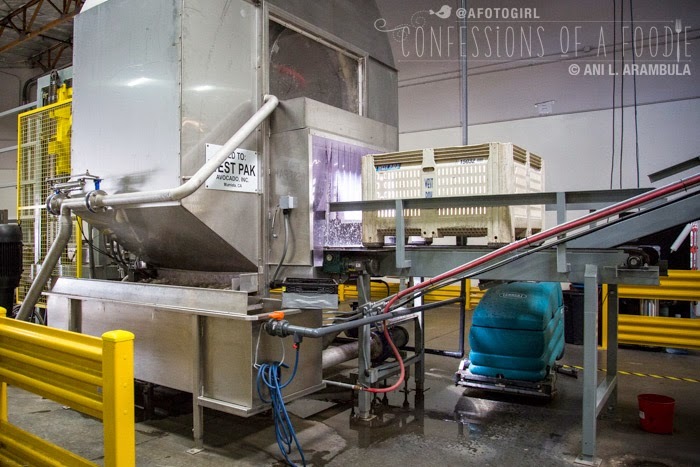 After the holding bins are empty, they go through a large car wash looking unit that sanitizes them. This ensures that there is no soil cross contamination between grower produce. What impressed me the most about West Pak was the amount of tracking and double-checking they do for each individual avocado. The attention to detail is just phenomenal. Even organically grown produce is handled separately and all the equipment is cleaned before the organic produce hits any conveyer belt. 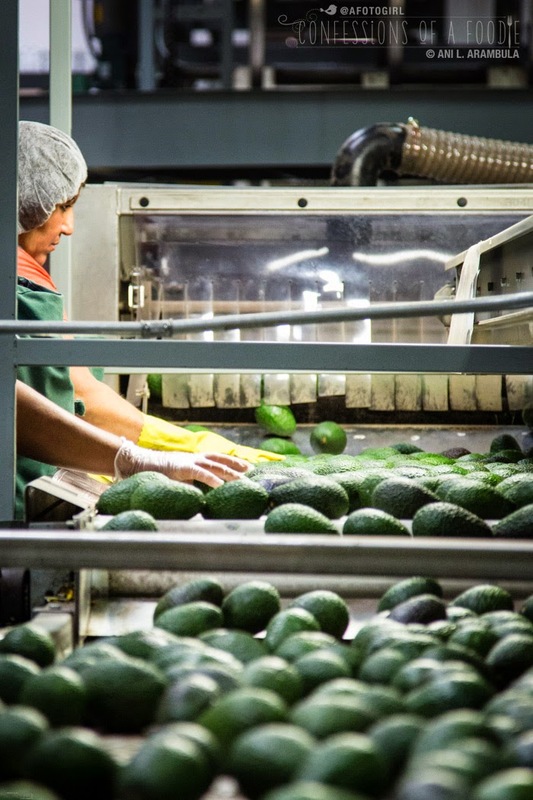 In addition, every avocado generates it's own tracking number as it goes through the facility and the entire process is videotaped so that at any given time, a grower can remotely log into the system and see where any particular lot number of their produce is in the process of being sorted and packed. The tour ended up being everything I thought it would be and so much more. 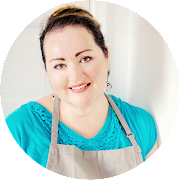 I learned a lot about one of my favorite fruits and now that I realize that they can be used for so much more than guacamole and smashed on toast, I am looking forward to picking up plenty of California avocados for some recipe development this summer. 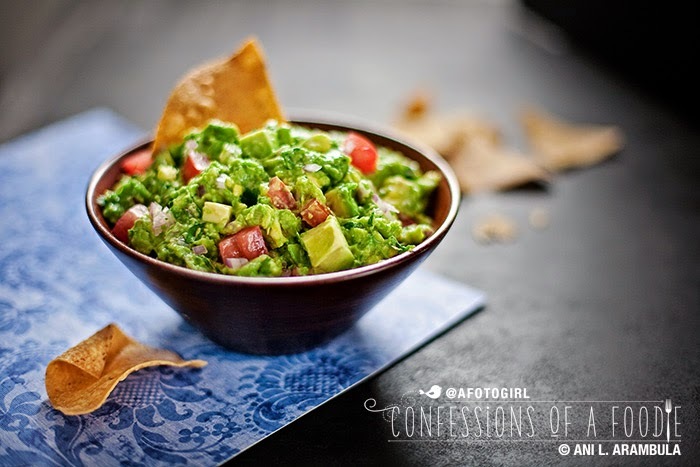 Until then, if you are looking for a killer guacamole recipe, click on the photo to see one of my more popular posts featuring my family recipe. 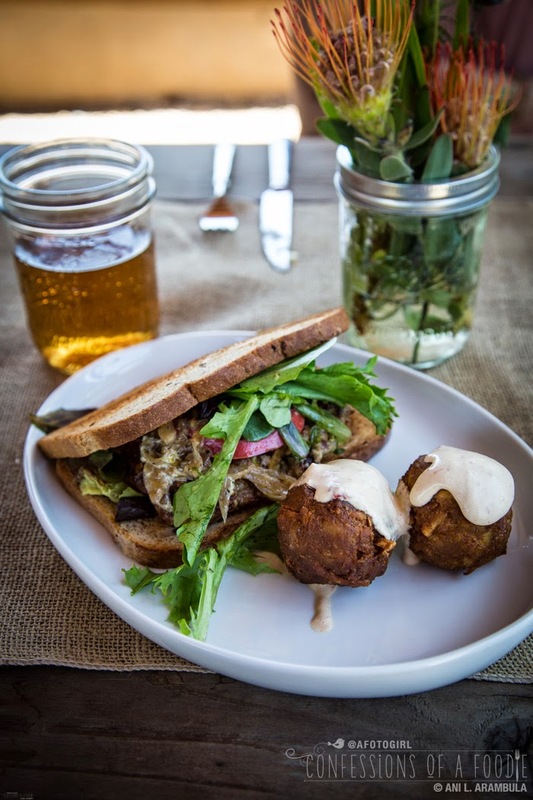 Then scroll down for a couple of recipes from our grove tour. for the California Avocado Commission. 1. 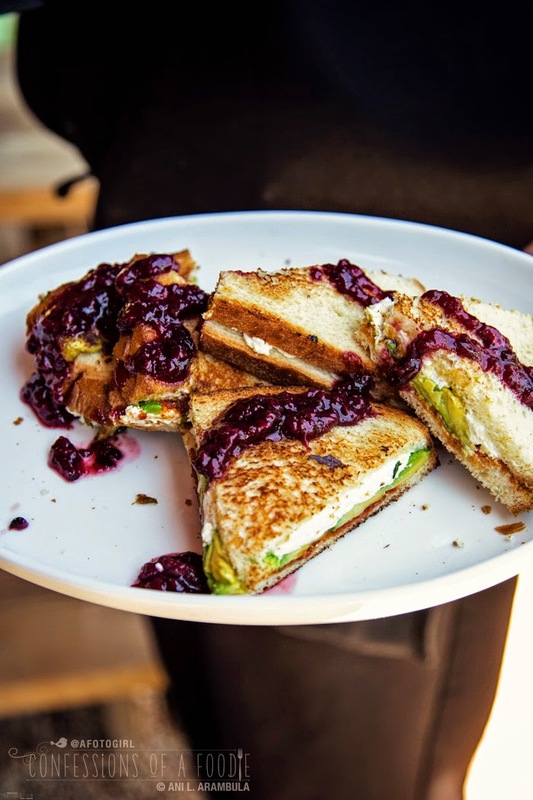 Spread sun-dried tomato pesto over bread and layer with goat cheese, avocado and basil. 2. Top with remaining bread slice and press to seal. 3. Transfer to skillet and brown each side in avocado oil over medium heat. Slice and serve. If using smaller or larger size avocados adjust the quantity accordingly. until soft but still firm in the center, about 35 to 40 minutes. sprinkle in the flour, salt and California Avocado mash, and mix until combined. 3. Measure 1 tsp. of the potato mixture and roll into a short cylinder, about 1 1/2” long and 3/4” wide. Place on a baking sheet and repeat with the remaining potato mixture. season with salt. Serve immediately. for participating on this tour. West Pak provided a week's worth of avocados for taste testing. I was not otherwise compensated and all opinions are my own. You captured the tour beautifully! I went on a tour a few years ago and loved it. It was a awesome three-day weekend filled with meeting lots of new people and exploring different ways to use avocado. I don't think I look at avocados the same way after the tour. Fantastic post with great information on my favorite fruit! What a great tour, I must go one day, thanks for posting! Tiffany & Melissa -- Thank you! What a fun day for you! I loved seeing all the great dishes that came through. That wedge salad ... gotta make that one! Lisa, they actually gave me that recipe, too. I should add it to this post because it was delicious.